Our Story – The Big Sky Centre for Learning and Being Astonished Inc. The Big Sky Centre for Learning and Being Astonished Inc. (Astonished!) is a not-for-profit organization incorporated in Saskatchewan in 2008 and was registered as a Canadian charity in 2011. We work in inclusive community to address barriers facing young adults with complex physical disAbilities (core members) by creating opportunities for teaching and learning, social, recreational and cultural engagement, and for employment and housing. In keeping with the United Nations definition we identify complex physical disAbility based on the environmental and human supports required by young adults to express their full capacities- this usually includes fully accessible buildings, accessible transportation, inclusive community, and assistance with personal care, mobility, communication, eating, and medical and health care. Participating in mutually beneficial areas of research. 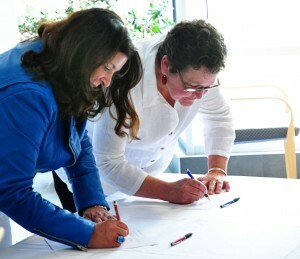 Dr. Vianne Timmons, President U of R, and Ruth Blaser, Board Chair Astonished! Inc, sign five year MOU.